Back in the days Silver Lake was a desirable location for film studios. We are talking 1910s to 1930s here and the area where Silver Lake is situated today was – well, let’s say rural. Plenty of space, plenty of sun – ideal for building studios and filming. From roughly the 1920s on it also became quite the place to live, because the city encouraged developers to build there. The lovely hills and the Silver Lake reservoir as a focal point served as an additional lure. With the terrain being as hilly as it is, a lot of houses were reached by staircases being built in lieu of “proper” streets and they are still there today. 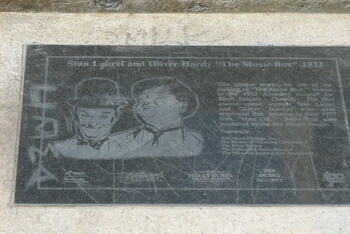 Yes, everybody has seen it – that is where “The Music Box” with Stan and Ollie was filmed. 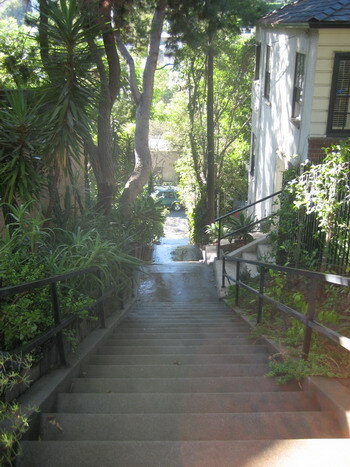 Many of the staircases are beautifully kept, with tiny gardens planted left and right, and nearly all of them are cool and shady. The reward after climbing up – and up – and up a bit more – is an amazing view over a green and hilly neighborhood so very much unlike the stereotypical idea many out-of-towners have of the city. But psssst, we better not tell them, or we will have hordes of tourists trampling up and down the staircases. 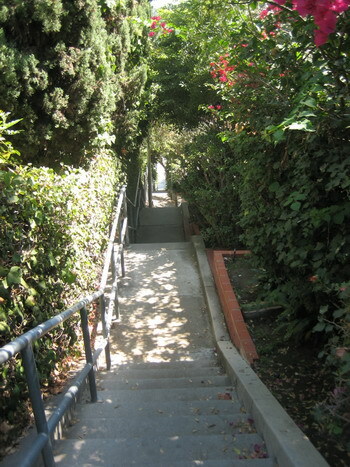 Or maybe not – the staircases of Silver Lake might be a tad too quiet and serene for them.